The Sunday Times: "Sometimes, Happiness is Pretty Simple"
The article is behind a paywall, but here's the link. Click here to see more articles about Burma Boating. "The Mergui Archipelago in southern Myanmar is located right across the border with Thailand - but far away from the tourism hustle and bustle. The magical empty beaches can only be reached by boat. A luxury cruise into paradise." Here's a link to the online version of the article. Click here to read see more articles about us. National Geographic Recommends Burma Boating as one of the "Best Trips of 2015"
The Burmese government kept the area off-limits to foreigners until 1997. Since opened to a handful of tour operators, the 800 islands scattered off the southern coast of Myanmar, in the Andaman Sea, are so seldom visited that many of them are known only as numbers on navigation charts. Currently, foreign visitors to the archipelago must be part of a guided boat tour. Tours depart from Kawthaung pier at the southernmost tip of Myanmar near the Thailand border. For a small group (two to eight people) charter or private yacht cruise including airport transfers, lodging, and meals, sign on with Burma Boating. Tours can be customized to fit specific themes, such as a photography and video safari. They also accept credit cards, rare among archipelago boat tour operators. Yachting magazine Cruising World writes about Burma Boating in its December issue. "The absence of tourists is largely attributable to Myanmar’s repressive government. Tourism numbers were for many years kept to a trickle, and foreign-owned businesses largely unheard of. However, over the past three years, the government has attempted to pull back the veil covering Asia’s last-frontier nation and introduce democratic and economic reforms. But while classic sailboats carry a lot of appeal, the real draw is the promise of empty islands topped with virgin jungle and azure-blue waters devoid of the white triangle sails that pierce the horizon in the world’s other tropical beauty spots. ´We sail for days without seeing any other boats or tourists,´ says Mayrhauser." You can find more articles about us here. "We return to the Meta IV to find Aperol Spritz sundowners waiting for us and learn that the crew has caught more than a dozen fish with handlines over the side of the boat. After a delicious meal of steamed fish and fried squid, we share a bottle of Myanmar Rum to toast a remarkable day. We are only halfway through our journey into one of the least-trodden corners of South-East Asia. There is a consensus among the guests that no one has experienced a more memorable holiday. None of us wants it to end." 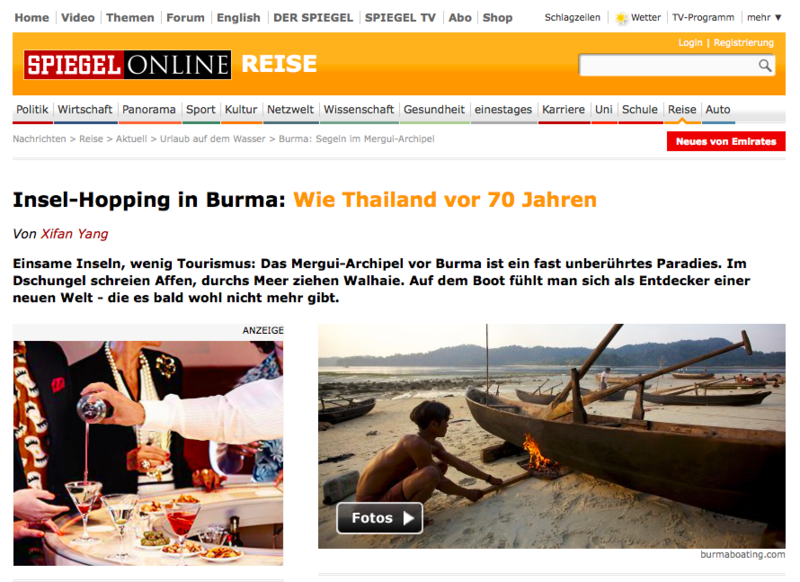 German magazine Yacht writes about Burma Boating in an article titled "Mysterious Asia". The text highlights the latest addition to our fleet: "The star of the show is the William Fife schooner ‘Sunshine‘". It's just a short story but we're excited to be featured again in one of Europe's oldest and most important yachting magazines. And doesn't Sunshine just look stunning when she's sailing? Click here to read more of our press clippings. Check out Bloomberg Businessweek's new video about the Mergui Archipelago, featuring an interview with Chris aboard Meta IV. 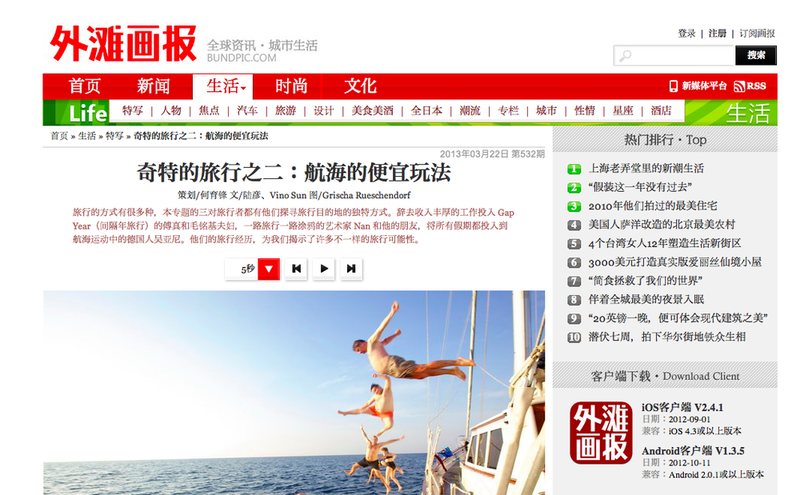 The Financial Times just published this interesting article about sailing in the Mergui. Very much worth reading for anyone who's getting ready for the trip! The South China Morning Post has a story today about the problems the country's economic development still faces. The lack of stable power supply, or sometimes any power supply at all, is one of the biggest obstacles for economic development. We're glad that Meta IV isn't reliant on the public power grid. And the New York Times reports about the ethnic problems in the North: Ethnic Rifts Strain Myanmar as It Moves Toward Democracy.